5 Frame "Deep" nuc available for pickup only, no shipping! (Tentative pickup date is May 4th, 2019) check website as date gets closer for updates due to weather. 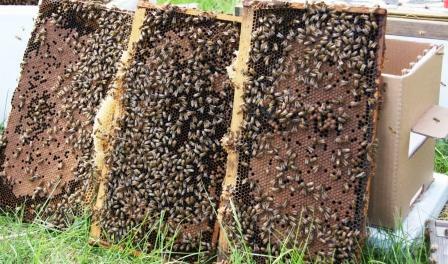 Queens are a Carniolan, Buckfast cross. Very strong nucs raised in Georgia by Boston Honey Co., 5 deep frames with brood, bees and honey ready to install in your hive. Comes in plastic nuc box with no frame exchange. Inspected by Georgia Dept. of Ag. Limited quantities available for this one spring delivery. All nucs must be paid for at time of ordering. We are sold out of our 2019 Nucs! I bought 2 nucs a couple of years ago. They both were great. I will only buy my nucs from Hillside! Honeybee Package 3 lb. with "Saskatraz" Queen/ "Sold Out for 2019"